General Information: Kohlrabi is a low, stout cultivar of the cabbage which has been selected for its swollen, nearly spherical, Sputnik-like shape. The name comes from the German kohl (cabbage) plus rabi (turnip), because the swollen stem resembles the latter. 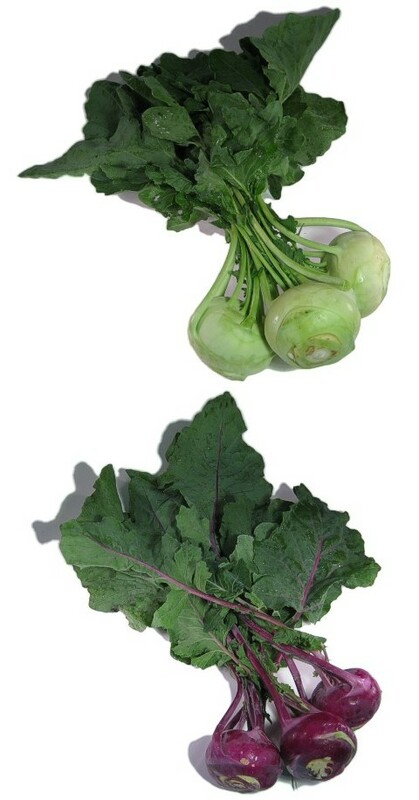 Kohlrabi has been created by artificial selection for lateral meristem growth, its origin in nature is the wild mustard plant. The taste and texture of kohlrabi are similar to those of a broccoli stem or cabbage heart, but milder and sweeter, with a higher ratio of flesh to skin. The young stem in particular can be as crisp and juicy as an apple, although much less sweet. Except for the Gigante cultivar, spring-grown kohlrabi much over 5 cm in size tend to be woody, as do fall-grown kohlrabi much over perhaps 10 cm in size; the Gigante cultivar can achieve great size while remaining of good eating quality. With flavors of turnip and radish predominant, kohlrabi is good peeled and served raw. Kohlrabi chunks may be sauteed or added to soup. The leaves too may be boiled and/or sauteed and seasoned to taste. High in vitamin C and potassium.